The volume, produced in collaboration with authors with many years of experience in research, evaluation and / or treatment of deafness, presents the results of the most recent studies on the medical, neuropsychological and rehabilitative aspects of deafness. It describes in complete detail the phases of assessment of auditory-perceptual, cognitive and linguistic skills, and takes into due consideration the linguistic, learning and listening contexts. Particular attention is given to the importance of taking care of the whole family in the belief that dealing with deafness does not mean only dealing with aspects related to hearing loss, but also and above all accompanying and supporting the family along the path of choices that they have to make (digital prostheses, cochlear implant, use of sign language, type of speech therapy, type of school, etc.). 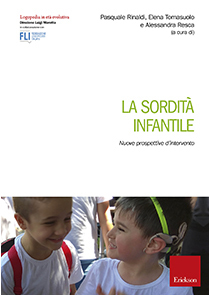 For the first time in a single volume, very different logopedic approaches, sometimes opposed to each other, are presented together, both from a theoretical and practical point of view, with examples of application, to offer families and workers a wide, not ideologically connoted, view on deafness and on the possibilities of treatment.